Modern townhouse offering flexible living space. 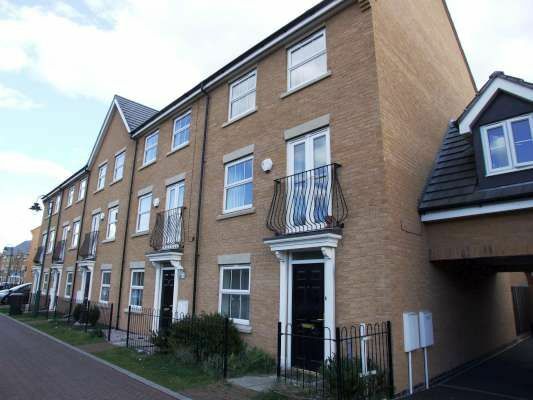 3 double bedrooms, 2 with en suite shower rooms. Study/bedroom 4. Utility room. Large lounge / diner. Spacious kitchen with breakfast bar. Garage and off road parking. This three/four bedroom property is located in Hampton Hargate close to local amenities including a large shopping centre and college. It benefits from full gas central heating, UPVC double glazing, three double bedrooms (two with en-suite shower rooms), separate study/fourth bedroom, ample storage, separate utility room, modern kitchen, enclosed rear garden and garage to the rear. On the ground floor is a spacious entrance hallway with a large storage cupboard. There is also a double bedroom (measuring approximately 10'3 X 9'8) with en-suite shower room and built in wardrobes. At the rear is the study (10' X 9'2) with French doors leading to the patio in the rear garden. Also at the rear is the utility room. On the first floor is the lounge/diner (measuring approximately16'6 X 16'2) which has French doors to a Juliet balcony. The kitchen includes a breakfast bar and is fitted with an attractive modern range of eye and base level units. There is a built in double oven and gas hob with extractor over. On the second floor is the main bedroom (measuring approximately 16'2 X 11') which has a range of built in wardrobes and an en-suite shower room. Also on the second floor is a further double bedroom measuring approximately 8'8 x 8'11 and the family bathroom, which is fitted with a white three piece suite with a mixer shower over the bath. Outside to the rear is an enclosed garden with patio and shed. There is also a garage in a block.